Fly Parasites are a mix of three tiny beneficial insects. Musccidifurax zaraptor, Musccidifurax raptorellus and Splangia cameroni. They are gnat sized, do not sting or bite and are nocturnal so they aren’t active when you and your animals are. Fly parasites have been proven highly effective in a wide range of applications. Horses, cows, poultry, feed lots and waste water treatment facilities. Anywhere flies breen and cause irritation and health problems to animals and humans. Flies are not particular about where they live or get their food, but the female fly is careful about where she lays her eggs. She looks for fresh manure, decomposing organic wastes or garbage. She will up to 21 batches of eggs during her brief 30 day lifespan. 1 or 2 days after these eggs are laid the tiny white maggots, called larvae, hatch. During the next 7 to 14 days the larvae will twice shed its skin. The new skin then hardens into a cocoon called the pupae. Inside the larvae in changing into a winged fly. 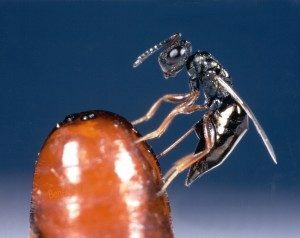 The female fly parasite instinctively seeks out the immature fly in its pupae stage. She bores a hole on the side of the pupae and deposits between 2 and 9 eggs of her own that feed off the fly larvae for the next 2 to 3 weeks. After they fly larvae has been consumed the parasites hatch and in 2 days the females start their cycle of seeking out and killing another generation of flies. Each female will kill an average of 100 fly pupae (130 flies each) in its lifetime. Because the fly parasites are killing the flies before the hatch and lay more eggs you can expect a 70%+ reduction of flies the first season of use. When using beneficial insects to control fly problems it is easier to prevent a fly problem from starting than to stop a problem once flies have multiplied. Flies lay 130 eggs a day, fly parasites lay 2 - 9. To be effective fly parasites should be released every few weeks during fly season. Start using fly parasites in the early spring when temperatures warm up to a consistent upper 60’s. Check the usage guide to determine how much you need. When we say 1 to 5 animals we mean horses or cattle. If you have 2 sheep figure they poop as much as one horse. Keep in mind this is recommendation. Factors such as how bad the fly problem was the previous year, how often manure is composted and neighbors in your area that have livestock should be considered when determining how much to release. Orders can be modified at any time with an email or a phone call.